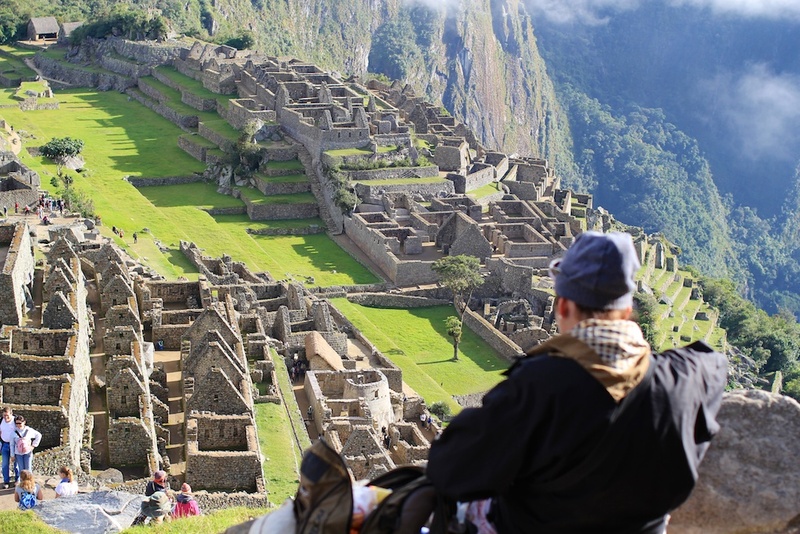 We had been planning a trip to Peru for a while and wanted to visit Machu Pichhu. When we learned that you could hike there instead of taking a train we decided that’s what we wanted to do. Recent regulations limit the number of people who can be on the trail to just 500 a day. We quickly found that we had to book the hike way in advance. It is also now required that the hike has to be booked through a local company that is licensed to operate on the trail. There are a few hundred companies to choose from. We reviewed many and finally decided to go with Llama Path. So we made our reservation in Jan 2011 for a hike in May 2011. We had never done a 4 day hike before and realized we would have some prep to do. A couple of months of training, backpacks, hiking poles, shoes etc later we were finally ready for it. We were picked up from Regocijo Square at 5:00am. We didn’t get much sleep the night before because we were busy packing and preparing for it. The idea was to sleep on the way. Two of our porters were waiting for us at the square while the bus had gone to our hotel to look for us because we were late (oops). It was dark and cold and finally the bus arrived. It had the other porters inside and our camping supplies. We couldn’t see their faces well and we were too tired – so we fell asleep. We were driving through a gorgeous landscape when my eyes opened. 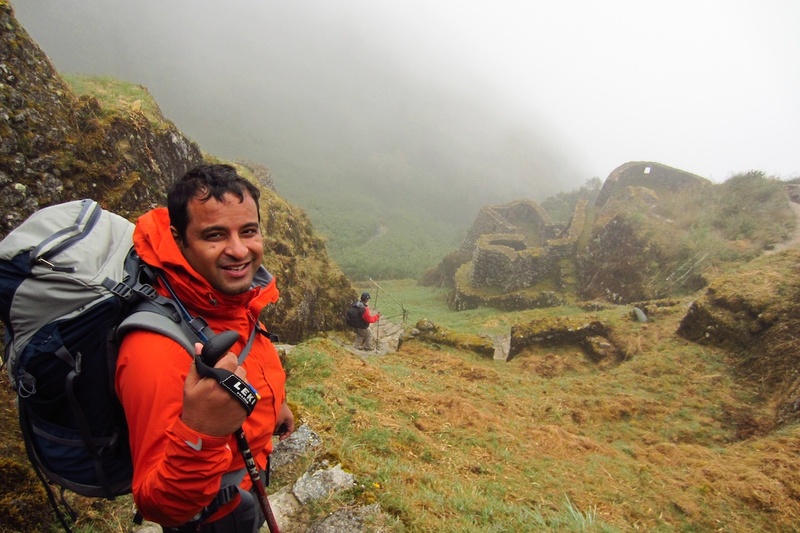 The porters were gone – they had stopped to get started on preparing stuff for the hike. We stopped at Ollantaytambo for breakfast. We were the only people at this touristico restaurant which was pretty huge. Buffet included slices of ham, cheese, bread and fruit juices. And egg. It was good. We stopped for a restroom break noting that it would be the last time for the next 3 days with a proper toilet. 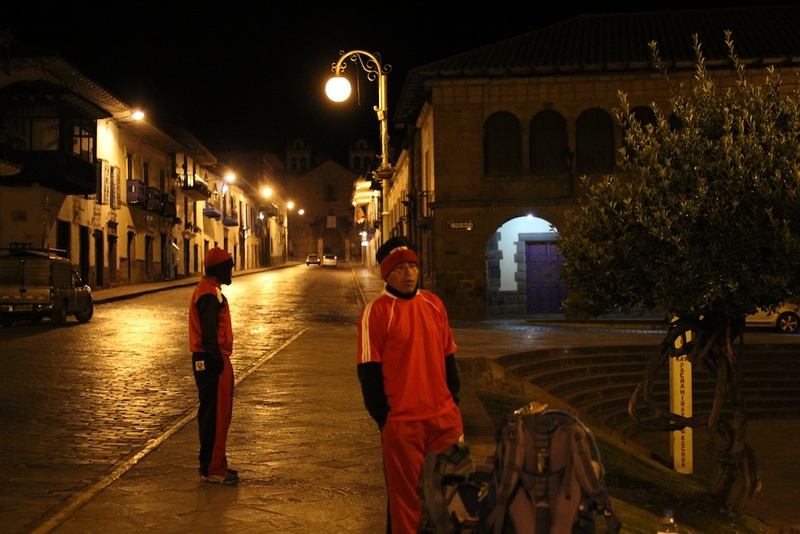 We continued on to Piskacucho, also known as Kilometer 82. We got off the bus and started prepping for the hike. Pack loaded, hiking stick in hand we set about. We crossed the Vilcanota River and got our passport stamped to indicate the start of the hike. The starting elevation was 8923 feet and we started at about 8:00am. It was what was called Inca flats. Mainly flat with a few ups and downs. It was kinda hot and we had about 25lbs each but it was fairly comfortable. We saw some ruins along the way. The first one was an Inca Fortress (‘Huillca Raccay’) where we stopped. Our guide told us how a lot of the trail we cover on the first day was destroyed by the Incas in an attempt to hide the trail from the Spanish conquerors. We also saw the beautiful Inca site called ‘Llactapata’ (officially called ‘Patallacta’). 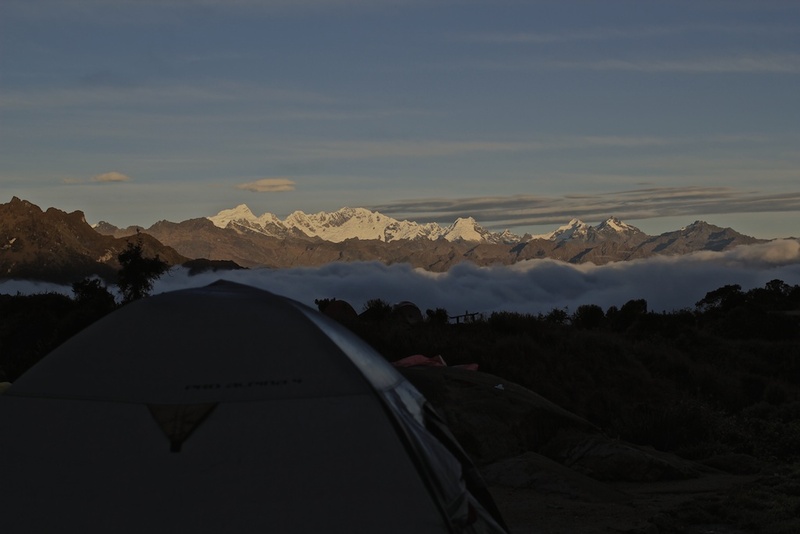 We could see the Urubamba mountain range that divides the jungle and the Andes and the beautiful snow-capped peak of ‘W’akay Willca’ (5860m/19225ft), known in books as Veronica for most of the hike. At around 1:00pm we had arrived at our lunch spot. Llama path plans their hikes to start early so you can be at Wayllabamba by lunch time. The lunch was awesome and delicious. 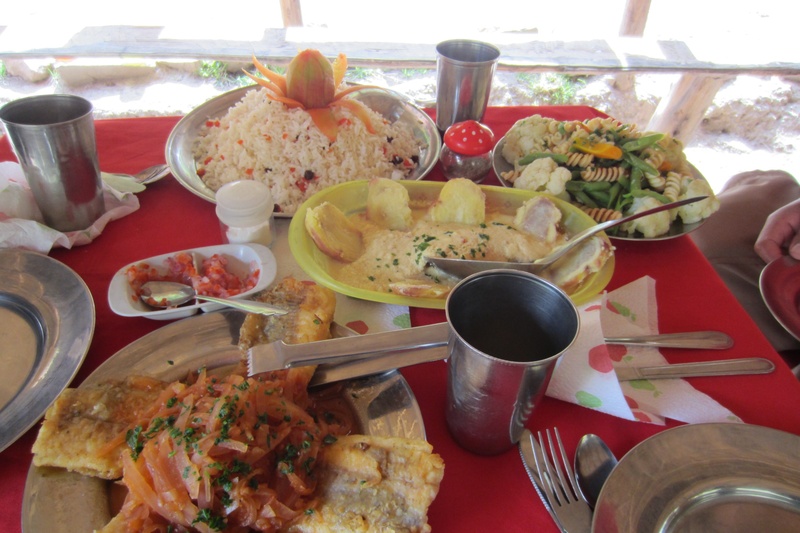 We felt guilty eating such amazing food; little did we realize there was so much more to come! We took off at 2:00 to start to climb up. Rubin showed us a campsite as we started. He told us that most other hikers will be stopping here for the night. But we will go on for another 90 minutes so we are away from the noisy village and can get a good night’s sleep. We reached our first campsite (Ayapata) at around 3:40pm and I think we were at a height of 9842ft in the temperate green valley of Wayllabamba. We cleaned up with wet towels and just stretched and relaxed for a bit. A couple of people were already at our camp site. A downer because we thought we were the first 🙁 It turned out they had left at 10:00am. That was 2 hours after we left. “How did you get here so soon?” “We ran!”. OMG. These guys ran the entire 12 kms and all the way up this hill. That’s so not us. We realized different people need different levels of difficulty to motivate and inspire them. We were just happy with a multi-day hike for the first time carrying our own stuff, and enjoying the hike itself one step at a time. We had a lip-smacking dinner, up in the mountains, and it was great. We then got our introductions with the porters for the first time. They were very friendly, a little shy and were amazed by our barefoot shoes. We couldn’t speak Spanish well though Jen was also learning to speak in Quechwa, which is what the porters could also speak. We didn’t have much conversation but it was fun. We had to get a good night’s sleep because “tomorrow will be the worst day”. We had to hike two peaks and come down two peaks i.e. climbing two 4000 ft peaks in one day! Our sleeping bags were plenty warm – we went with down bags – and we slept very peacefully. We wanted to wake up by 5:00 but we woke up at 5:30. We had delicious breakfast and by the time we got started it was around 7:00 am. We had wasted crucial time in the morning by now. The thing is, the sooner we had left, the cooler it would be and the less harsh the sun would feel and we would be less tired. However, we got lucky because it turned out to be cloudy so the sun wasn’t too harsh. Our first ascent was towards the highest pass (Abra de Warrmihuañusca/’Dead Woman’s Pass’ – 13779ft).It was all uphill and steep and I was barely able to maintain my pace without putting my heart-rate into overdrive. 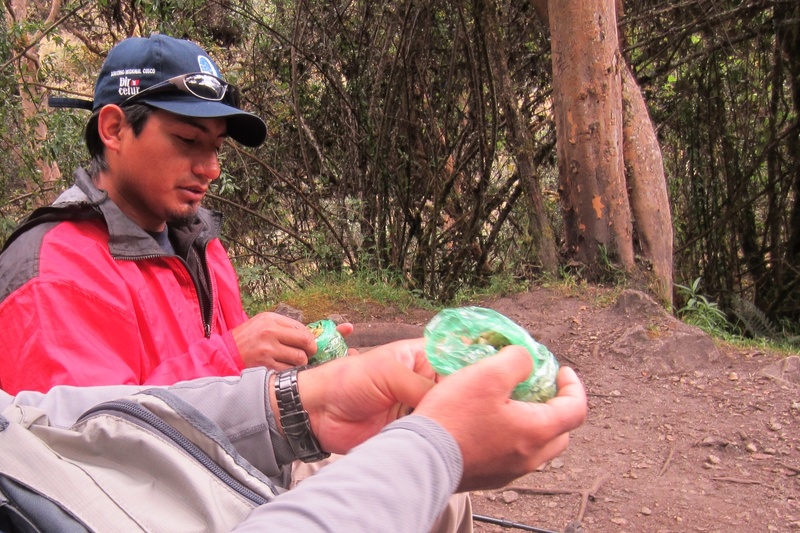 45 minutes into it, we took a break and Rubin said it was time for the coca leaves.We pulled out a wad of coca leaves from our packs. We mixed it with some activator which was made with beans and something that make it look like green soap. We then rubbed it and put it in the side of our mouth. Then we were instructed to chew it just a little bit so that the juices start to flow and mix with the activator. “Keep it there for as long as you can, slowly sucking on the juice”. This is supposed to help with acclimatization as you rapidly gain altitude. It also helps your body do more than what it can on will-power alone. I am not sure if the coca leaves did anything because I wasn’t feeling anything different. However, I reached a very zen state with my body. I was timing each uphill step at a pace which gave my heart enough time to pump oxygenated blood before my muscled used it up. It also gave enough time for my lungs to perform the gas exchanges without overwhelming me. This way, I was slow but extremely steady and could go on and on without actually stopping or taking a break. Some other people on the hike would go past us, going really fast. Then we would catch up with them when they were taking a break. I don’t think we reached any faster compared to others but I definitely feel that I enjoyed the balance I was feeling without being overwhelmed. We made it to the halfway point in great time. As others sat down to take a break, we decided we were ready to keep going. And we did. Step by step we kept trudging on. An hour more into it, and I was finally beginning to feel exhausted. I was cursing myself that I decided to bring 5lbs of camera equipment with me! What was I thinking? Jen was doing better than me. She is strong. The last 45 mins is a blur of sorts. I know we were walking. The sun had finally come out and it was beating. And I was aware of every muscle in my body while feeling completely numb at the same time. My pace was slower than in the morning, but it was the only way to keep myself from stalling. I’d rather keep taking steps and keep inching forward than stop and cool-down and slow down my metabolism. It would be more expensive to start the engine again – better keep it running. The last 100 steps were even steeper. I could feel the texture of each step through my barefoot shoes and I think that connection made me keep going. There were about 20 people already up there – sitting and looking down at us. I took a 5 second stop and with a final push of energy made it to the top. At about 11:00am. The most gorgeous view I had seen so far! Mountains everywhere, green and round and smooth. It was amazing how quickly my body recovered from the slog. I sat for 2 minutes and was immediately back on my feet, taking out my camera and taking as many pictures as I could. We saw the long-long-long line of people snaking up the path we just took. The farther you looked, the more people you could see – like crawling ants. Many were coming from the lower camp so they had to make up for the 1.5 hour jumpstart we got in the morning. It felt good to be up already and escaping most of the heat. So here were were, at the highest point of the trail. “If you made it through this one, the rest is going to be easy”. After a short rest here, we began the descent to the lunch stop which was located at Pacaymayu (11646ft). So that was about a 2000 foot descent. All downhill steps. Our feet were sore and going downhill hurt the most. But we kept going hoping we maintain our forms and try to keep knee stress low. It wasn’t easy given what we had been up to all morning. Jen wanted to take a bathroom break when we were about an hour away from it. We kept going because we could see the campsite and didn’t realize we were that far away. Unfortunately, the prominent thing I remember is a group of chatty Americans who were right behind us talking about uninteresting things. It felt like a whiney, inappropriate conversation given the context of where we were and how gorgeous everything was. We slowed down, hoping they would pass but they would slow down too. So we tried speeding up but they maintained pace with us. So they stayed with us, 20-50 metres behind us, and I think we were kinda distracted by that throughout the descent. We finally made it to the campsite at 2:00pm. The porters had left the morning campsite *after* us. But they had passed us, made it through the top and the descent, set up camp, cooked food and were waiting for us. Yeah! They almost fly up and down these hills. I was feeling very tired by then. I think I was feeling some altitude sickness and a little dehydrated. The 3-course meal was super enticing, but I was feeling nauseous. I couldn’t eat much. I felt bad. Clearly the chef had put a lot of effort into this but I was incapable of doing any justice to it. I also felt like I just couldn’t do another peak and descent the same day! I ate some food and then I was done. My headache started getting worse and I was feeling unwell. I wanted to lie down. They had already anticipated this (they do this often enough). There were mats waiting for us and we fell flat on them. I think I took a 20 minute nap. I woke up to them wrapping up the tents. I still had a headache and the nap didn’t do anything. They gave me coca tea and I started sipping on it. “I don’t think I can do the next part” I told Ruben. He said I can take it easy. About 10 minutes later, I was feeling much better. My body had stabilized and fixed itself and I felt I was ready enough to start. We strapped on our backpacks, took a restroom break and were ready to go. It was a 2 hour steep climbing to Runkuraqay pass, back up to 13,000 feet. On the way up to the pass we were able to look down and see our campsite. It was nice to see it disappear. 30 mins later our porters caught up with us and passed us swiftly. We arrived at our campsite at 5:30. It was really dark. It began to get foggy and we couldn’t see much. Also, because we were on the other side of the mountain, the sun wasn’t beating on us. It was cooler and began to feel very wet. We were walking through a cloud-forest and it felt like we were walking in the clouds. The Inca site, ‘Phuyupatamarca’, was located a few minutes walk from the third pass and after visiting this, we continued walking (3000 steps!) through the cloud forest and the impressive agricultural Inca site of ‘Intipata’ until we arrived at our third campsite Wiñay Wayna (2680m/8792ft). 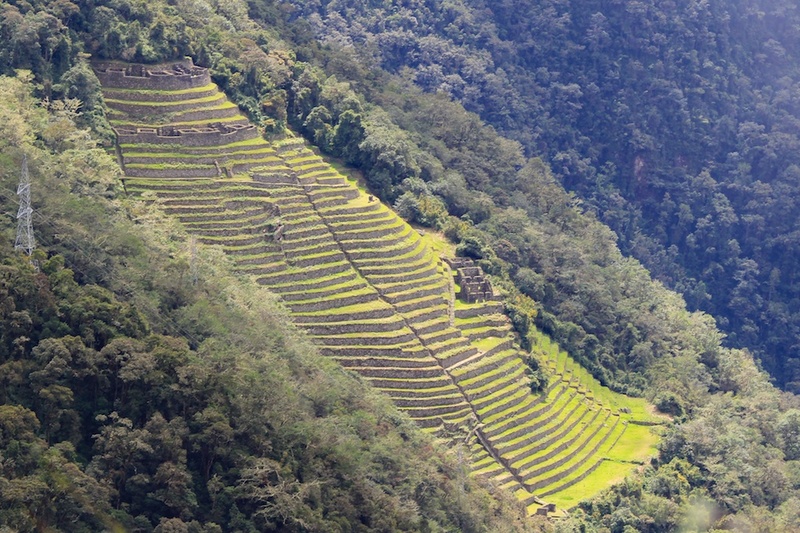 A short distance from this campsite was the Inca site of the same name ‘Wiñay Wayna’ (‘Forever Young’). This is the most impressive site on the trail! Temperature during the night was around 12º C.
We left the last campsite at about 5.00am on the final day (breakfast 4.30-5:00am). It was an early start in order to get to ‘Inti Punku’ (‘Sun gate’) (2730m/8792ft) before sunrise. This is the place from where we had the chance to see our first dramatic view of Machu Picchu (2400m/7873ft) with the sun rising over it! Tough luck, it was too cloudy. We waited around but the clouds didn’t budge. So we just kept going. We walked down the last part of the trail to the spot where people usually take the classic photo of this ancient city. Actually, it was a long wait because it was still pretty cloudy. We stood patiently waiting for the city to come through. There was a British tourist next to us who seemed very annoyed. She said “I don’t understand what the big deal is about this place”. Well, she had arrived by train that very morning. And we had been walking the last 4 days so we were definitely not on the same page on that feeling! But when the clouds finally parted and the grand expansive city shone through, everyone was speechless. It was so beautiful and the teasing reveal was very climactic. Finally we walked down to Machu Picchu itself! Rubin gave us a walking tour and after that we started exploring the city by ourselves. It was really pretty and deserves a separate blog post. So here it is, our experience hiking the trail. It was an awe-inspiring journey to one of the most interesting places I have ever been to! Thank you so much for these advices! 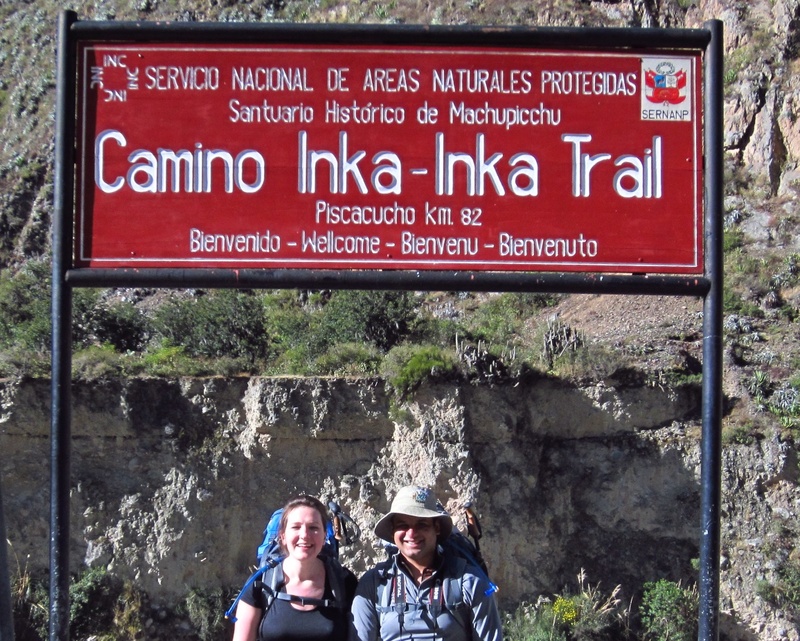 Im going to do the inca trail with my friend in november. We r very excited, but i must admit that im a bit scared. Im defenitly going to rent hiking poles! The walk through Lares towards Machu Picchu is truly beautiful because of the landscapes and villages that you visit. I really liked your publication and I hope you continue publishing on more walks in the Andes of Cusco.